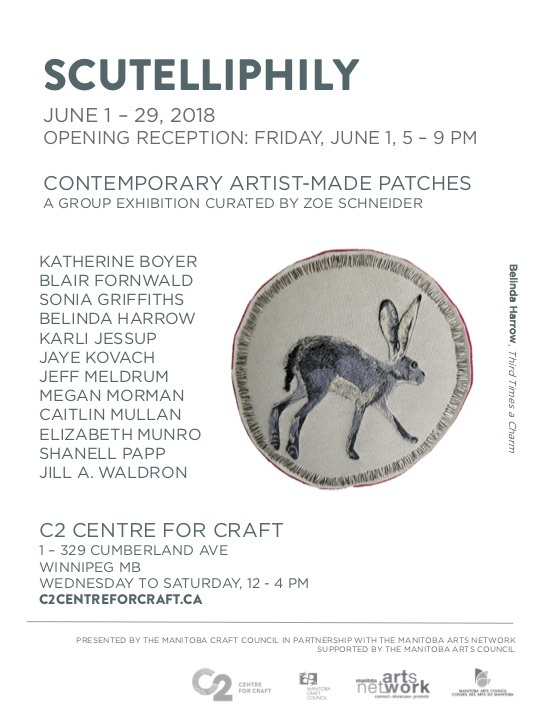 Scutelliphily is a group exhibition curated by Zoë Schneider. Scutelliphily explores three central themes: personal branding, cultures of display, and the role of commodity in a non-traditional art context through artist made back patches. Scutelliphily loosely translated refers to the collection of patches, or the phileein ‘love’ of scutellus ‘little shields’. Imagine a denim jacket or vest adorned with pins and patches; it might belong to a teenager, rebellious punk, or tough biker. Like the Caddisfly Larva who build their cocoons using a self-generated silk to hold together pebbles, plant debris, and sand; humans build our exterior selves through our hairstyles, clothing and cosmetics. These augmentations to appearance have myriad functions for the person; one can strategically conceal or reveal, ward off, entice, show affiliation with a larger group, and/or proudly display ones’ interests. Fundamental to a patch is its connection to the body. This is an object whose agency is built upon its placement and movement through public life. This exhibition considers the implications of moving a wearable object into the institution and off of the body, acknowledging the long-standing conversation on art and craft. The mass produced patch and the one of a kind patches in Scutelliphily speak to the contradictions or opposing interests found in craft. That of functionality and accessibility juxtaposed by the handmade nature of craft creates tensions in the worth of a craft/art piece. Scutelliphily examines how twelve artists respond to the varied themes that can be teased from a patch – or ‘little shield’.